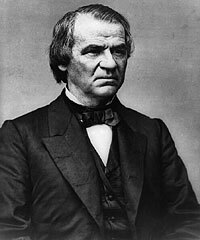 Andrew Johnson was the war Democrat who became Lincoln’s second vice presidential running mate in 1864 after being offered the Democratic vice presidential nomination by Stephen A. Douglas in 1860. 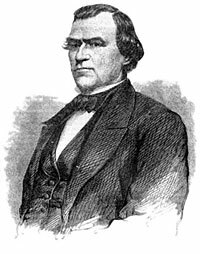 Johnson supported John Breckinridge in the 1860 general election, but broke with Southern Democrats on the issue of secession in 1861 for which he was widely vilified in the South. 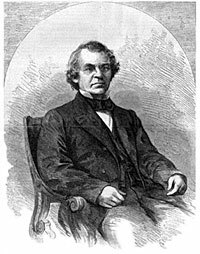 A tailor by trade, he served as a state legislator (1836-37, 1842-43), Congressman (1843-53), Governor (1853-57) and Senator (1857-62). He served on the congressional Committee on the Conduct of War. He resigned from the Senate when he was appointed military governor of Tennessee by President Lincoln in early 1862. Afterward, according to Senate aide John W. Forney, “Johnson was under a state of great excitement, and was in my immediate charge. I was confident, however, that he would be subdued before the President finished his inaugural. To the surprise of everybody however, except, perhaps, the Cabinet, Mr. Lincoln did not consume five minutes in repeating it. As soon as the people outside saw that he was done, loud cries were raised for Johnson, upon which we hastily retreated to the Senate chamber, and closed the unhappy and inauspicious day.”3 The President later said: “I have known Andy for many years…he made a bad slip the other day, but you need not be scared. Andy ain’t a drunkard.”4 Forney quoted the President as observing: “It has been a severe lesson for Andy, but I do not think he will do it again.”5 Forney was well versed on the situation since, according to Johnson biographer Hans Trefousee, “…on the night before the inauguration, he celebrated with his friend Forney, with whom he shared many glasses of whiskey.”7 Trefousse noted that Johnson had had at least three glasses of whiskey before he went to the Senate, going back to Hamlin’s Senate office to drink the third. Although Johnson was occasionally a heavy drinker, Trefousse determined that there was no evidence that Johnson was an alcoholic—unlike his two oldest sons, both of whom were alcoholics. 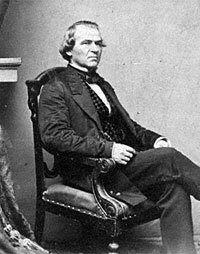 Johnson became President on the assassination of Abraham Lincoln, with whom he had served in Congress in the late 1840s and whom he visited on the afternoon of Mr. Lincoln’s assassination. Johnson himself lost one son and one son-in-law in the war. He had been a strong proponent of slavery before the War and a strong supporter of the Union once the war began. Johnson was unique among Southerner senators at the outbreak of the war in retaining his seat rather than supporting the Confederacy. He supported emancipation, but opposed the application of the Emancipation Proclamation to Tennessee and opposed the extension of rights and assistance to blacks after the war. Obstinate and opinionated, insecure and class-conscious, well-dressed but frequently ill-tempered, Johnson as President quarreled with Secretary of War Edwin Stanton and with Congress over Reconstruction and the Tenure of Office Act. He was impeached on February 24, 1868. Conviction failed by one vote—in part because of the weakness of the case and in part because of opposition to Senator Benjamin Wade succeeding Johnson as President. He sought vindication of his record and was reelected to Senate in 1875 shortly before his death—after losing elections for Senate in 1870 and Congress in 1872. Samuel C. Williams, The Lincolns and Tennessee, p. 28. Michael Burlingame, editor, Walter B. Stevens, A Reporter’s Lincoln, p. 156. John W. Forney, Anecdotes of Public Men, pp. 39-40. H. Draper Hunt, Hannibal Hamlin: Lincoln’s First Vice President, pp. 197-198. John Forney, Anecdotes of Public Men, p. 177. 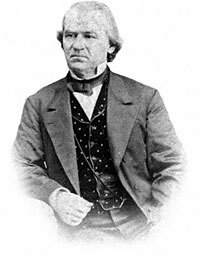 Hans Trefousse, Andrew Johnson, p. 188. Frederick Douglass, Life and Times of Frederick Douglass, p. 355. Jean H. Baker, Mary Todd Lincoln, p. 249. William Hanchett, The Lincoln Murder Conspiracies, p. 83.